"I just wanted to say thank you for completing the additional work for us yesterday. 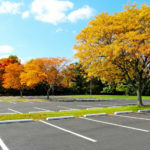 The parking lot looks great and Justin was very helpful in carrying out the work as we planned. Thanks again."